* You could easily throw on a cropped crew-neck sweater and wear it as a skirt. 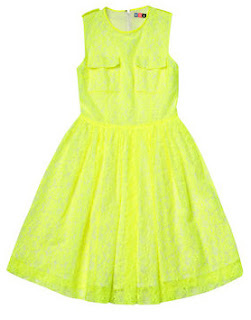 Or layer a fitted, cropped black jacket over it to tone down the neon-ness. I also like the idea of wearing something contrast-y underneath, like a black or pink bra or slip; this will counterbalance the dress' sweetness. So glad you like it all! I can so see that dress on you!